YPS Valves Ltd manufactures and stocks a broad range of gate valves suitable for use in various industries and under the most extreme conditions. With over 4 decades of experience in the industry and a global client base spanning a number of industries, our team of professionals possess the knowledge and experience to accurately advise clients on the best product solution for them. 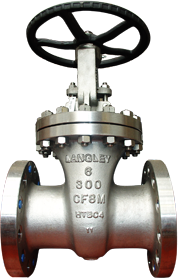 We manufacture our own range of valves under the brand name Langley as well as stocking a broad range of products from other proven manufacturers such as Velan, Neway, OMB and Calobri. Through the collaboration of our manufacturing and stockist services, we are able to quickly modify existing products to provide bespoke solutions for clients.